Zapier is a web integration platform that allows you to connect popular web services together without being a developer. Nicereply integration with Zapier lets you easily automate tasks between 400+ web apps. Check Zappier’s app directory. Each connection (or integration) between 2 apps that automates your workflow is called a “Zap”. A Zap is made of a "Trigger" (ex. : When I receive a new email in Gmail...) and an "Action" (ex. : ...then send me an SMS message). Zaps run automatically and transfer data without any work on your part. Only Zaps that are “On” count against your limit. Rather than checking your Nicereply rating feed, stay concentrated on your customers. Use this easy automation to start pushing new ratings into your Slack and keep your team in the inner-circle with customer feedback. Creating Nicereply accounts for new members of your customer support team may be time-consuming. With a little automation help, you can create new accounts in Nicereply for every new user in Desk. First of all, you have to sign up for a Zapier account. They have a Free plan with up to 100 tasks per month. It’s fine if you get 100 new subscribers per month. For more, you will need to upgrade to a paid plan. The Basic plan starts at $20/month. 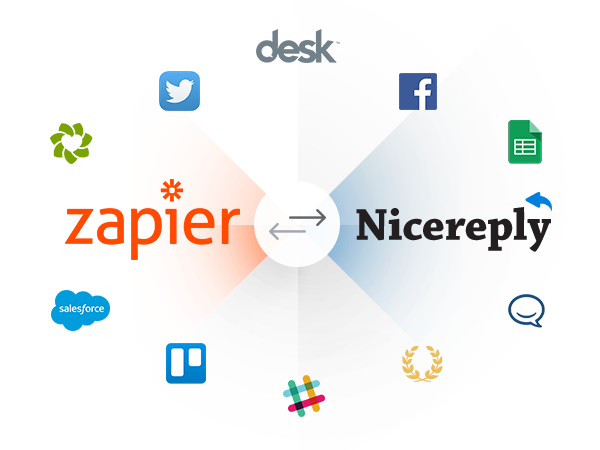 See the Nicereply + Zapier setup help, or you can create your own Zaps by following this guide.